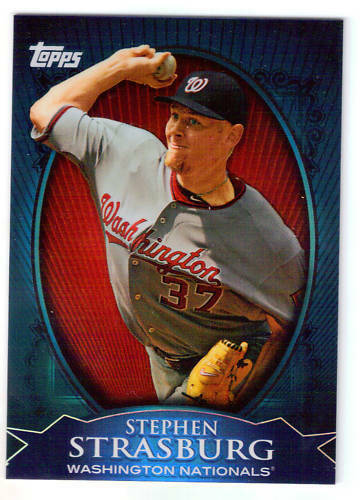 Several collectors have stumbled upon a Wal-Mart exclusive Stephen Strasburg (ebay auctions) card while card hunting recently. The card is a chrome refractor that Topps has putting retail boxes over the last couple of years. The cards were found in a Topps value box ($14.98) where you get one 2010 Allen and Ginter pack and six Topps Series 2 packs. There are three guys found in this mini-set. The other two are Cal Ripken Jr. , and Babe Ruth . The cards fall one per box. Good to know where Strasburg stands in place of baseball history. If I'm Topps, I'm starting to worry about market saturation. Keep going with Strasburg, fine, but I'd start diversifying, and fast, especially given Strasburg's recent struggles and DL stint. I realize that there's a quick buck to be made here, but the more they produce, the more supply is out there and your market equilibrium is going to fall. At some point, the marginal return on another Strasburg is zero and could potentially be negative. I'm totally on the sidelines as far as Strasburg-mania is concerned but the three cards are pretty cool looking. Personally I'd rather have the Ruth and Ripken. topps is doing fine with strasburg. Milk him for all he's worth in 2010. Topps should save Bryce Harper for 2011 - if you use him in draft picks and prospects, what is going to drive 2011 Bowman sales?